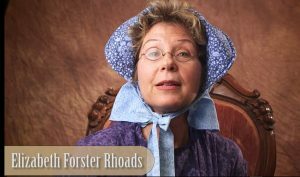 Once baptized, Elizabeth Rhoads was unremittingly converted to following the admonitions of the Prophet and of the gospel principles. At Brigham Young’s request to join the 1846 Migration West to look for a safe place for the “Saints” to dwell, she and her husband turned their backs on the relative comforts of their Missouri abode. Facing the unknown had become a way of life for her and her husband, Thomas. After bearing 22 children, that included at least five sets of twins and one set of triplets, she dutifully, patiently, and lovingly made preparations for a new adventure. She gathered up 14 of her own children to head West, just a portion of the 50 Rhoads Family members with adventure in their veins. Staying well ahead of Former Governor Lilburn Boggs and the Donner and Reeds who had joined that same westward movement, the Thomas and Elizabeth Rhoads braved their way to the Sacramento Valley in October 1946. While her two boys, John and Daniel, went back up into the mountains to join in the Donner Party rescue efforts, she devotedly tended to her large family. While doing laundry in Dry Creek during the record breaking cold winter of 1847, she and her daughter, Polly, gathered shiny metallic flecks from the creek. The flecks were shown to her husband when he returned and, indeed, Elizabeth and Polly had discovered gold while doing laundry. Elizabeth could not overcome the demands of the 2000-mile journey and the devastating winter, and died in September 1847. However, her family’s contributions to California and LDS Church history are testaments to the way the Lord increases our abilities through steadfast obedience and unwavering faith.